In 1990, after the end of the Pinochet regime, the newly-elected democratic government of Chile established a Truth and Reconciliation Commission (TRC) to investigate and report on some of the worst human rights violations committed under the seventeen-year military dictatorship. The Chilean TRC was one of the first truth commissions established in the world. This book examines whether and how the work of the Chilean TRC contributed to the transition to democracy in Chile and to subsequent developments in accountability and transformation in that country. The book takes a long term view on the Chilean TRC asking to what extent and how the truth commission contributed to the development of the transitional justice measures that ensued, and　how the relationship with those subsequent developments was established over time.It argues that, contrary to the views and expectations of those who considered that the Chilean TRC was of limited success, that the Chilean TRC has, in fact, over the longer term, played a key role as an enabler of justice and a means by which ethical and institutional transformation has occurred within Chile. 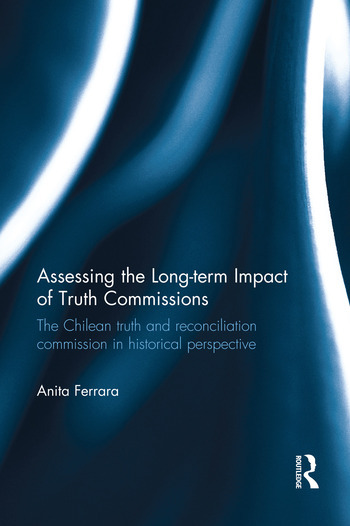 With the benefit of this historical perspective, the book concludes that the impact of truth commissions in general needs to be carefully reviewed in light of the Chilean experience. This book will be of great interest and use to students and scholars of conflict resolution, criminal international law, and comparative legal systems in Latin America. Anita Ferrara has recently founded the Centre for Transitional Justice and Development (CTJD), in Rome. She obtained a PhD in Law at the School of Oriental and African Studies (SOAS), University of London, in 2012. She has been a Graduate Teaching Assistant at SOAS and has given several lectures on the Master course on "Justice, Reconciliation and Reconstruction in Post-Conflict Societies". She has previously worked for United Nations Agencies as OHCHR and UNDP, in the fields of Human Rights and Governance, in Chile and Botswana.